All the previous times we said “This was the hardest day ever!” weren’t true. THIS was the hardest! 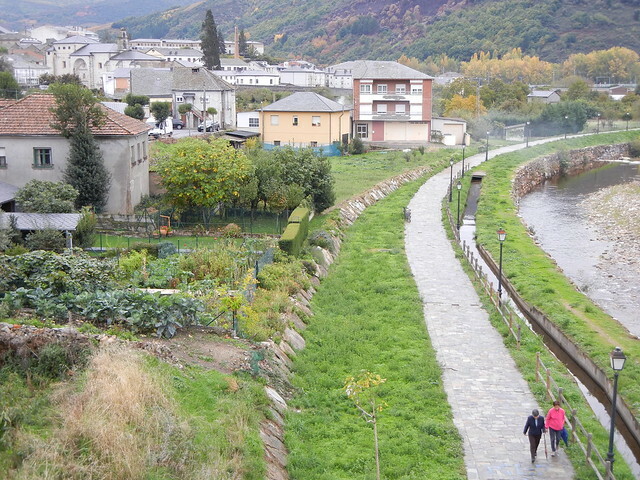 What possessed us to walk all the way to Villafranca del Bierzo when we could have walked just 15.5 km and stayed in Cacabelos? 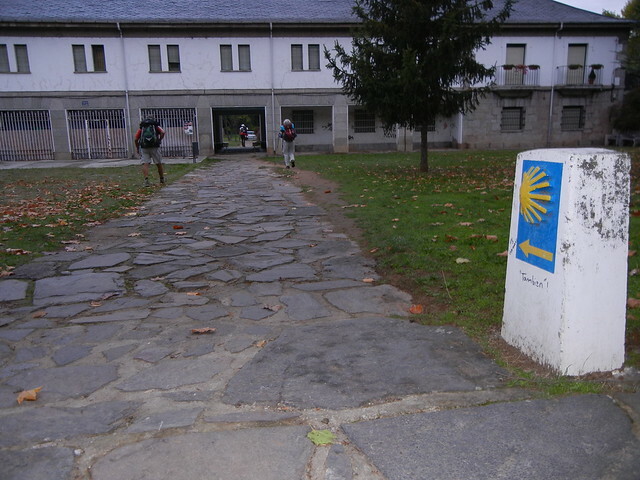 Cacabelos was an important medieval pilgrim halt with five hospices founded for the care of pilgrims. We could have used their services and then, when we got our aches and pains healed, we could have checked out the town’s attractions. There is an archaeological museum with artifacts from nearby Roman settlements and a wine museum celebrating the increasingly popular wines from the Bierzo area. Checking out the vino tinto is one of our favourite things to do, and we passed it by. Drats! Another opportunity we missed was to take a detour to the Monasterio de San Salvador de Carrecedo located in a beautiful and very peaceful landscape just 3 km from Cacabelos. 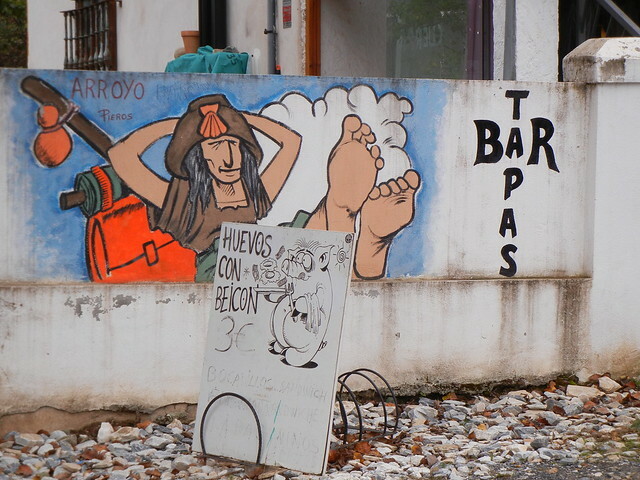 So there are things to see the next time we walk the Camino – unless we spoiled any desire to do that by over-exerting ourselves today. If there is a “next time,” we will put in a special request for sunshine! Enough about what we could have done, should have done, and shouldn’t have done; here’s what we did do. We left our hotel just after 8 o’clock and made our way out of Ponferrada via the iron bridge that gives the city its name. The original bridge was reinforced with iron way back in the 11th century. We followed a path through a park alongside the river towards the outskirts of town. The Camino even went through an unused building! 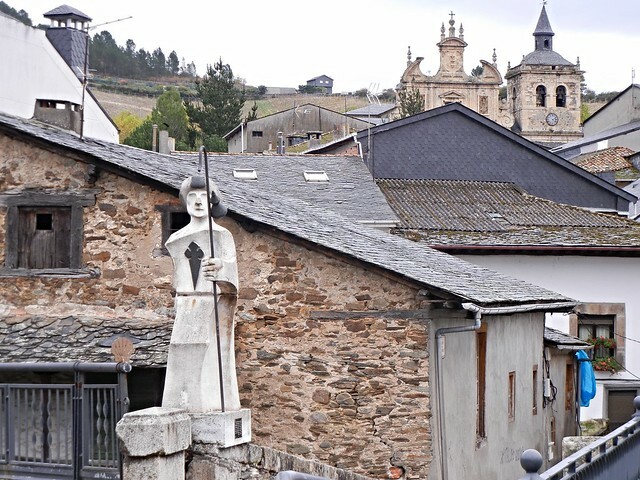 It was at the little village of Compostilla, 2.5 km outside of Ponferrada, that we stopped for breakfast and then carried on through Columbrianos, Fuentes Nuevas, Camponaraya, and finally to Cacabelos, where we stopped for another cafe con leche. Having yet another cup of coffee is our excuse to take off our backpacks, rest awhile, and gather energy to carry on. All morning we knew rain was a possibility but there were just a few sprinkles until finally, when we reached Valtuille de Arriba, the skies opened up. The rain wasn’t going to stop any time soon. To make matters worse, Dave’s lower back was bothering him. 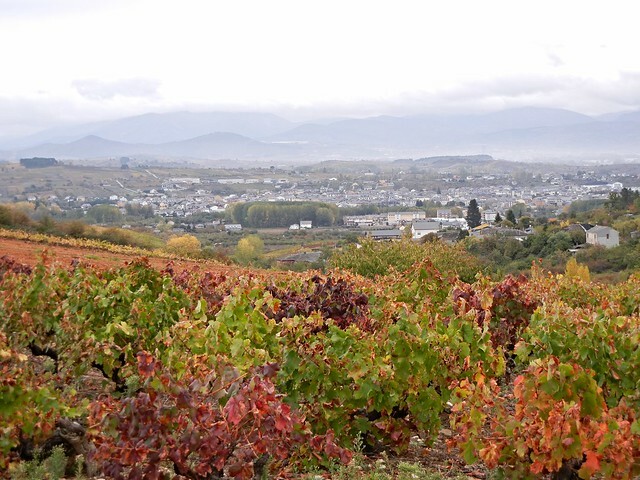 We spent so much time thinking about aching bodies and watching the rain drip down off the front of our hoods, that we could easily have overlooked the beautiful El Bierzo landscape with its rolling hills covered with vineyards. How gorgeous it would have been in the sunshine! 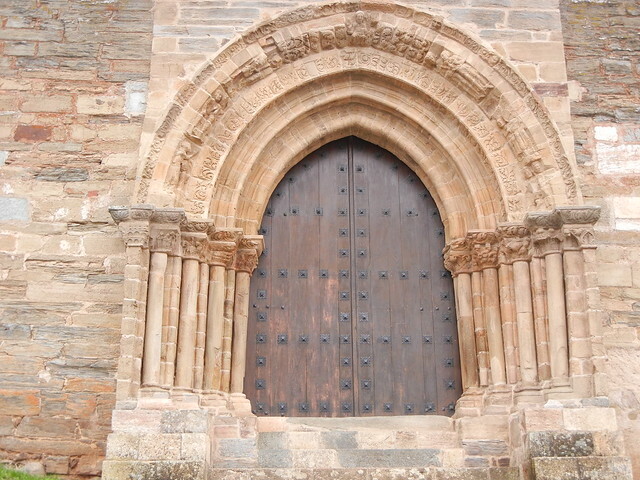 We came down into Villafranca del Bierzo past the 12th century Romanesque Church of Santiago with its “Door of Forgiveness.” Medieval pilgrims who were unable to continue to Santiago received absolution here, the same as they would in Santiago. On this account Villafranca was sometimes referred to as the “other” or “little” Santiago. What a relief it was to finally get settled into our room at Hostal Burbia. After a shower and a rest, we appeased our phenomenal appetites with the menu of the day at a restaurant/bar that turned out to be a very noisy gathering place for family and friends and to watch the football game on the big screen. Dave and I had to shout to hear each other. By the time we left the restaurant, the rain was coming down in torrents. Walking back to our hostal in our sandals and socks in the downpour wasn’t a problem, though, because we had just emptied an entire bottle of vino tinto during dinner. We considered our walk in the rain to be an opportunity to see how well these steep streets with their fist-sized boulders cemented together channel the rain. I sooooo miss those breakfasts! 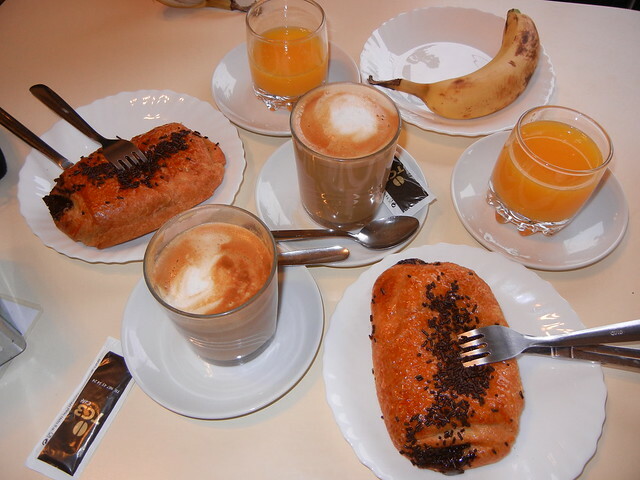 All of it, the cafe con leche, fresh squeezed orange juice and the neopolotanos (sp?). Mmmmmm! Dave and Judy, You are displaying the “right stuff” that makes a true pelagrino. You will overcome! Oddly enough, we are reliving “the Agony and the Ecstasy”, today caught in a downpour returning from Pompei. Tomorrow Napoli, but this time with a guide. What a series of slide shows this is going to make!! We can hardly wait.